Last Updated: 9/26/2012 | File Size: 15394 KB | Price: $35.95 | Downloads: 184 | Developer: Digiarty Software, Inc.
WinX DVD Ripper for Mac is an all-in-one Mac DVD ripper program designed to rip all content of DVD to all prevailed video formats, e.g. iTunes, MP4, MOV, FLV, MPEG, AVI, as well as, faultlessly convert all DVDs (even tough protected DVDs) to iPhone/5/4S/4, iPod/5/touch, iPad, Apple TV, Android, PSP, etc. Being fully customer-oriented, this three-step Mac DVD ripper ensures all users to handle with facility. Multi-core CPU (fully use up to 8 core processor) and Hyper-threading supported, it gives you ultra-fast ripping speed. Furthermore, this Mac DVD ripper allows users to copy DVD to hard drive and USB with original video and original 5.1 Channel AC3/DTS Dolby audio within 5 minutes. What's more, it works perfectly on Mac OS X Tiger/Leopard/Snow Leopard/Lion/Mountain Lion. Multi-core CPU and Hyper-threading supported, this program offers ultra-fast conversion speed with x2 faster than common Mac DVD ripper in the market. Deinterlacing - Change interlaced scanning DVD movie to progressive scanning to output clearer video quality. Continuously update to support the latest DVD copy protections and a growing number of platforms by Mac, Apple, Google, etc. Featured with 1:1 DVD copy function, it allows decrypting and backup DVD to hard drive as single MPEG2 file within 5 minutes, while keeping sharp image and crisp audio. Backup DVD to USB disk driver and plug the USB driver to PSP, or some modern TV sets which can play videos from USB interface directly. Statement: First, please download the orginal installation package by clicking the download link. Of course you may also download it from the publisher's website. Using WinX DVD Ripper for Mac crack, key, patch, serial number, registration code, keygen is illegal. The download file hosted at publisher website. We do not provide any download link points to Rapidshare, Hotfile, Depositfiles, Mediafire, Filefactory, etc. or obtained from file sharing programs such as Limewire, Kazaa, Imesh, Ares, BearShare, BitTorrent, WinMX etc. Software piracy is theft. 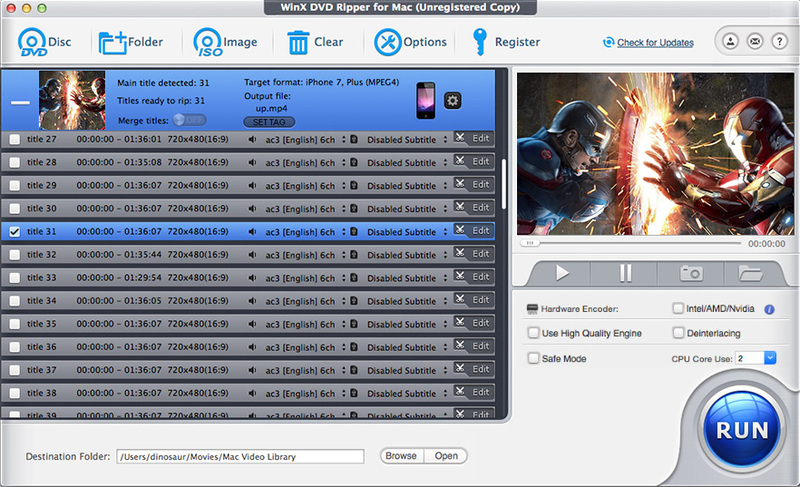 If you like WinX DVD Ripper for Mac please buy it.